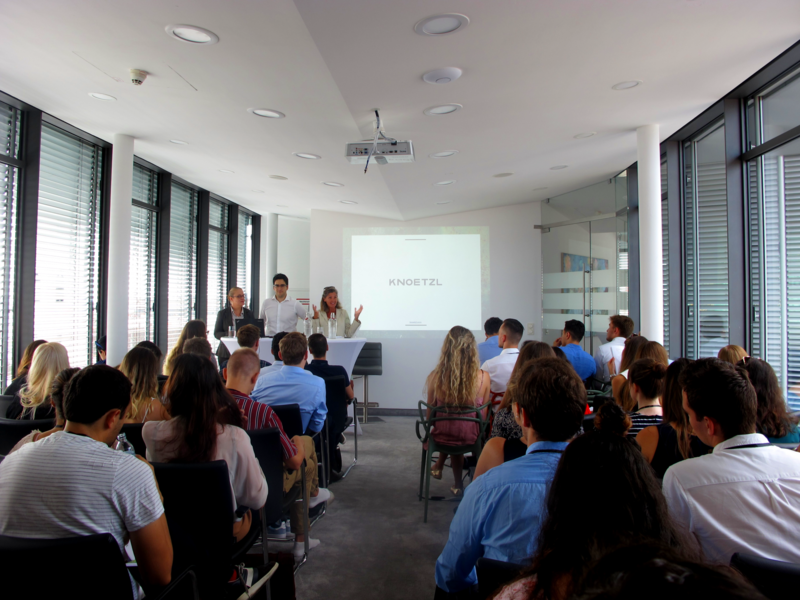 The unusual summer heat in Vienna was no deterrent for over 55 international students and volunteers from ELSA Austria to join a workshop last Thursday on Best Representation in Court hosted by KNOETZL as part of the 7th ELSA Summer Law School on Dispute Resolution. Seasoned KNOETZL advocates, Bettina Knoetzl, Emmanuel Kaufman and Natascha Tunkel shared their hands-on experiences in highlighting which skills to apply in the courtroom and what communication techniques to utilize to achieve an optimal outcome. Our court and arbitration tribunal veterans demonstrated to the ELSA students how performance in the courtroom will factor into the perception of their case. From an advocate’s look and overall demeanor to the lawyer’s way of communicating, every aspect matters from the second counsel walks up to the courthouse. The relevance of creating and building upon strategy for cross-examination and a lawyer’s thorough knowledge of his or her objectives and understanding when to stop asking questions was emphasized to the participants. the nine stages of a conflict including the assessment of the best available tool to solve the dispute: litigation, arbitration or mediation – which is better? Or better: when is which better? After taking a break for some pizza and lasagna and surveying the commanding view from our rooftop terrace, the students split into several groups to discuss a role play example centered around the issue of copyright. The participants were invited to explore and analyze the interests of both sides, propose solutions and alternatives and find a desired common ground. Then, the counterparty was introduced into the proceedings, with a lively and instructive role-playing negotiation against, and under the guidance of, our seasoned lawyers including veteran negotiator Tim Pfister. The workshop ended with a speed networking session with an array of KNOETZL lawyers from the most senior to the most junior, giving the students the opportunity to ask questions and get honest feedback from the lawyers on every step of their career ladders. KNOETZL is proud to respond to, and thanks, ELSA Austria for their continuing interest in our help with this important, multinational summer program. It is a true pleasure for us every time to feel the enthusiasm of our new young lawyer friends and for the opportunity to learn, in turn, from the brilliant legal minds that will soon hit the stage of real-life law practice across Europe and beyond.